Brecht’s back working for Blender Institute With Campbell the three of us will keep supporting all other developers and work on some of the most essential improvements that just take a long time to work on. Exciting times ahead! EDIT: ok, watched the video, now it probably made my week! good times ahead! Great to see you back Brecht. Ton u da man !!! Put some advice in the title of this thread so people with a weak heart don’t look at the video at risk of heart attack!!! Incredible rendering speed blender is going to have. Great news and a great boost to blender’s development!!! wow wow wow Thanks Brecht ! So, this is what I call improvement! It’s also nice to read about ideas of improving the flexibility and cooperation between Blender and other rendering engines. An other great Brecht’s work ! Is Cycles supposed to suport microdisplacement and Ptex ? 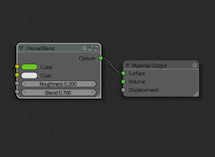 Does it mean a new interface for Game Engine’s shaders or nodes for GE’s shaders, too ? Think : How can you do a VFX for a movie without caustics when you want to make some glass breaking and so on ? hmm… it was logicaly that this will happen and the real need of N-Gons from B-Mesh and the new Nurbs that are waiting to merge from near half year. This it is the need and hope will be more developers on the boat.